Growing Up Christian: What defines you? I wear hearing aids. In the early 1990’s I lost most of my hearing in my left ear, and I lost about half of my hearing in my right. The condition is called cochlear otosclerosis, and I do not know why this started affecting me in my early 20's. During my first year of teaching, I struggled to hear my students. 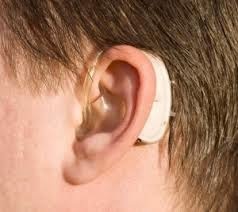 After multiple hearing tests, I was diagnosed and fitted with hearing aids. They helped significantly, but didn't solve my hearing problems. On the positive side, in bluetooth mode, I can listen to the TV directly through my hearing aids, which is fantastic. Sounds in the night do not wake me, because I take out my hearing aids when I sleep. In fact, sometimes I do not even hear my alarm in the morning, but thanks to my wife I get up on time. On the negative side, I have to ask my wife and kids to repeat themselves a lot. If someone talks to me from the other room, I can rarely understand what she says. If someone covers his mouth when he talks to me and I cannot read his lips, I usually cannot discern his words. Yes, I have hearing loss. Yes, I wear hearing aids. But, my physical handicap does not define me. I am a Christian school leader. Life does have trials, and many of them are extremely difficult. But God promises to work all for good for Christians (Romans 8:28), and he uses trials to refine us (James 1:2-4). My trials do not define me. My limitations do not define me. My handicaps do not define me. My relationship with Jesus Christ defines me. The love of my heavenly Father defines me. The power of the Holy Spirit living in me defines me.